HB Melvin Gordon vs. Khalil Mack – It’s not often that a running back might find his most productive run defending opponent on the edge, but Mack is no average player. Mack leads all edge defenders in the NFL in run stops (16) through five weeks, and his run-defense grade of 96.2 is also the highest among edge defenders. Melvin Gordon will provide a stiff test for him this week. Gordon had the highest-graded Week 5 running back performance and now sits third overall in halfback grades on the year. He’s top-15 in every PFF Elite statistical category for halfbacks except for breakaway percentage, where he still ranks 17th. In elusive rating, which measures a runner’s success beyond the point of being helped by his blockers, he’s fourth in the NFL at 63.9. TEs Hunter Henry and Antonio Gates vs. Cory James – One of the quickest ways for the Chargers to get their offense right is to start featuring what is likely the best tight end duo in the league. So far this year, both of their yards per route run have taken a significant step backward, Henry from 1.99 to 1.48 Gates from 1.41 to 0.81. Utilizing easier throws for Rivers over the middle should take the pressure off of him, but LB Cory James might make those throws more difficult this week. James has improved his passer rating when targeted this year to 86.3 (21st in the NFL among linebackers that qualify) from 101.4 last year. He is dealing with an injury, but at this point it is believed that he’ll play. 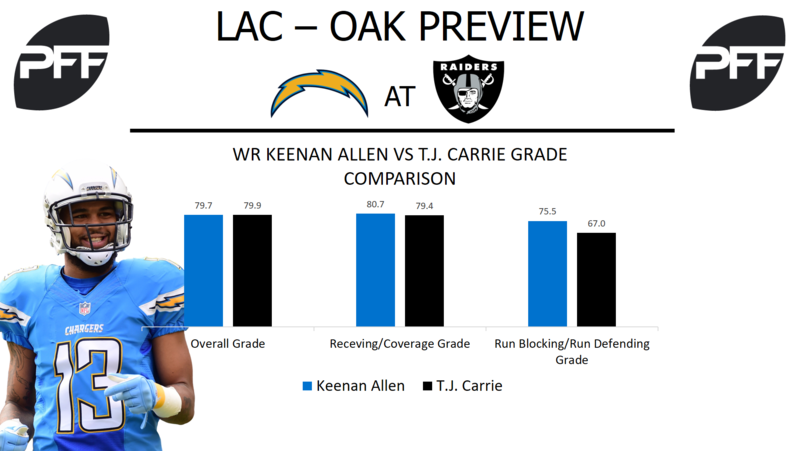 WR Keenan Allen vs. CB T.J. Carrie – With Mack and James defending the Chargers’ other bread-and-butter options, a lot of this game could come down to Allen versus Carrie. Carrie ranks 16th among corners in passer rating when targeted when in the slot and his 79.9 overall grade ranks 31st among corners, but Allen might have the advantage here. He’s tied for the most targets in the NFL out of the slot, he’s 10th in yards per route run in the slot, and he’s seventh in catch rate from the slot, and his overall grade of 79.7 ranks 17th among receivers. WR Michael Crabtree vs. CB Casey Hayward – Crabtree has become the go to guy in the Raiders offense this season. He ranks second in passer rating when targeted among wide receivers with 15 or more targets at 147.0. 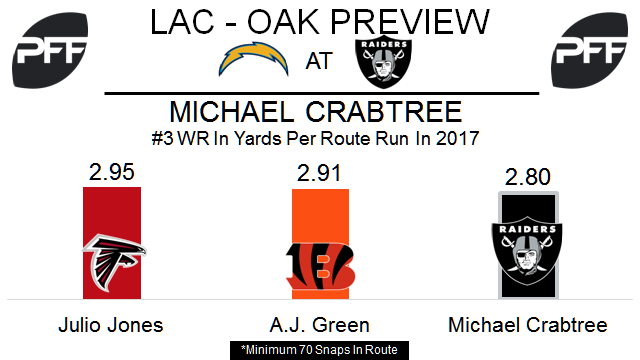 Crabtree’s 2.80 yards per route run is third best of receivers with 70-plus snaps in route this year. Hayward ranked sixth at cornerback last season with an 88.4 overall PFF grade, and is backing it up with an 86.9 grade this year that ranks eighth. He has allowed 16 receptions for 277 yards and two touchdowns in 174 snaps in coverage. Hayward ranks fifth at cornerback with five passes defensed this season. T Marshall Newhouse vs Edge Melvin Ingram – Newhouse is off to a solid start in Oakland after signing with the team this offseason. His 73.3 PFF grade ranks 23rd among 69 qualifying offensive tackles this year. Newhouse has only allowed a quarterback pressure on 4.3 percent of his pass-block snaps this season, the 11th best rate at offensive tackle. Ingram is the fourth-ranked edge defender this season with an overall 88.9 PFF grade. In two games against the Raiders in 2016 he had one sack and eight total pressures in 75 pass-rush snaps. HB Marshawn Lynch vs LB Hayes Pullard – Lynch might be the key to the Raiders turning around their offensive woes this season. He has forced 12 missed tackles on 61 touches this year, and ranks 14th in PFF elusive rating (a runner’s success beyond the point of being helped by his blockers). Lynch has barely been involved in the passing game with only four catches on seven targets for 38 yards. Pullard was on the field for 50 of the Chargers defense’s 69 snaps in Week 5, the most of their linebackers. His 32.2 overall PFF grade ranks 85th of 87 qualifying linebackers this season. He ranks 76th at linebacker in run stop percentage at 4.7 percent.